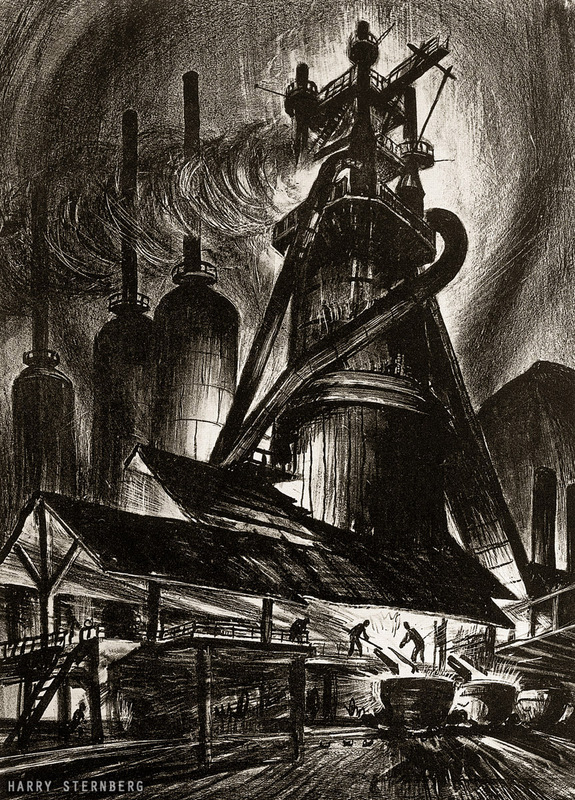 I have a thing for depression-era depictions of industry and labor. That's why when I recently discovered the work of artist Harry Sternberg I was amazed - not only by the power of his work but also by the fact I hadn't discovered him sooner. So this post is a tribute to the work and passion of an artist I almost missed. To label Harry Sternberg an "obscure artist" would be inaccurate. 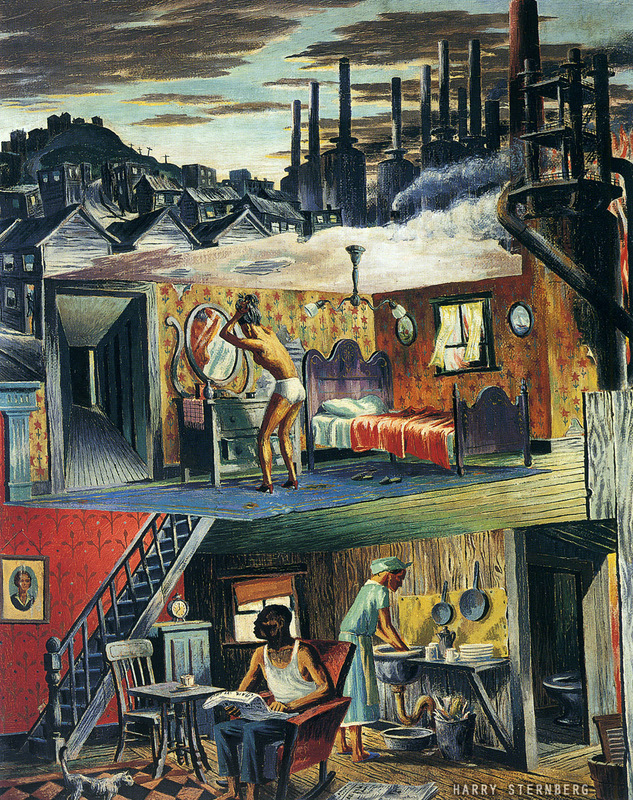 He was not considered obscure in his day, but I think time has lumped him in with and overshadowed him by contemporaries such as Thomas Hart Benton, Grant Wood and John Steuart Curry. 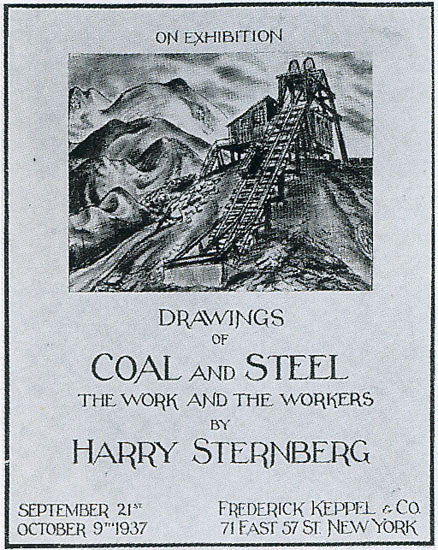 But Harry Sternberg stands apart for me - mainly because of a common interest in Pennsylvania's steel and coal industries. We have traveled to and gained inspiration from the same places; Sternberg during the height of those industries, and me after their decline. 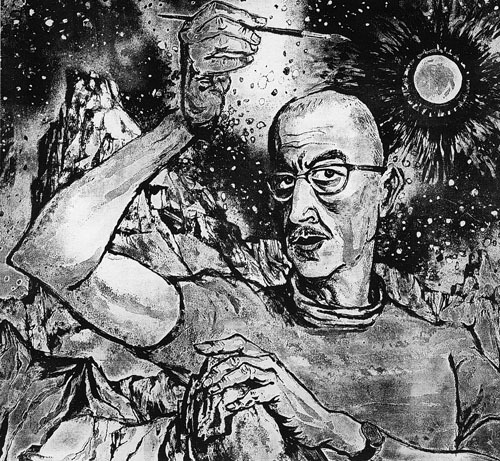 Harry Sternberg was a New York artist whose career spanned an astonishing seven decades. His work evolved of course, and his medium and subject matter changed over time. 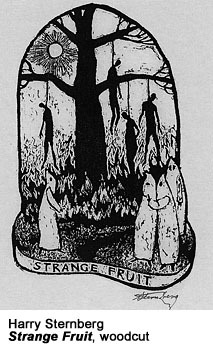 Although I personally consider his amazing woodcuts to be the creme of his artistic output, it is his depression-era Coal and Steel body of work (only partially represented here) that speaks to me personally. 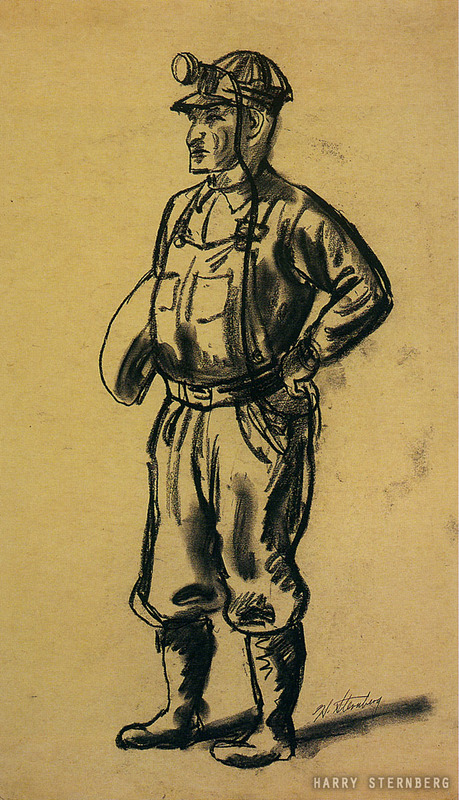 Unlike other successful artists of his time, Sternberg didn't attempt to glorify or romanticize the industries and workers he depicted. No smiling, Rockwellian workers proudly brandishing their tools. 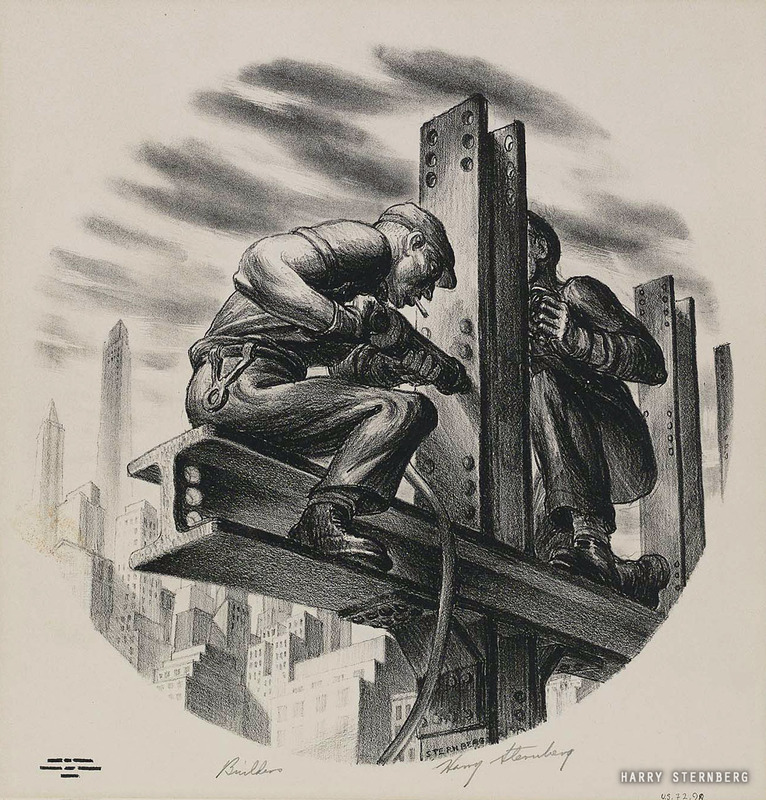 Instead of Saturday Evening Post covers, Sternberg illustrated covers for left-wing labor magazines such as New Masses. He spent time among the workers. He lived in their homes and went with them into their mines and mills. His work reflects the hardship and grit of their lives, and his experience among them led him to join in their fight for unionization. During this period of Sternberg's life, he used his art to challenge social norms and draw attention to the human condition. 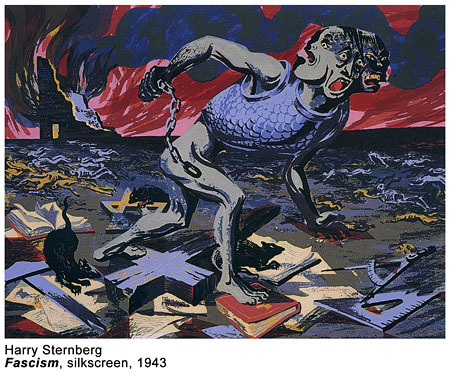 In addition to labor reform, Sternberg's work took on topics such as racism and fascism. 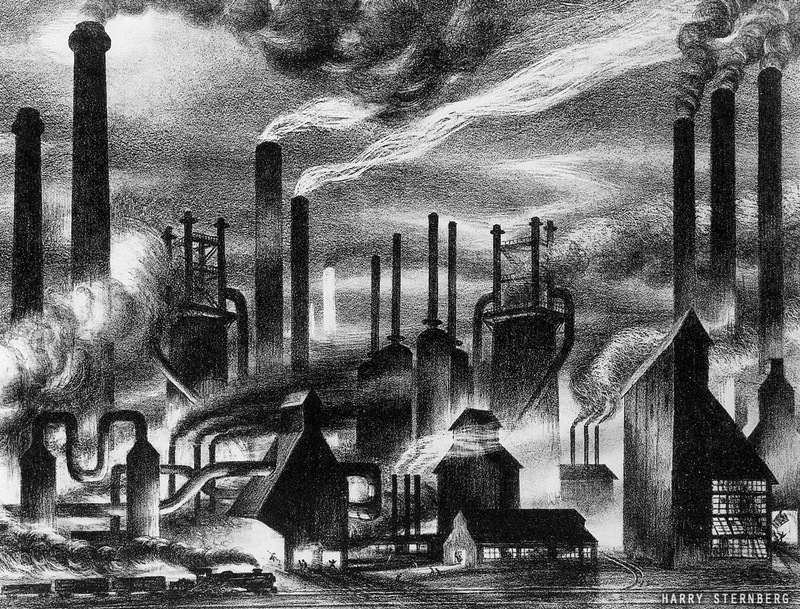 Though much has changed in the 75 years since Coal and Steel, much remains the same. Instead of the great depression, we now have the great recession. 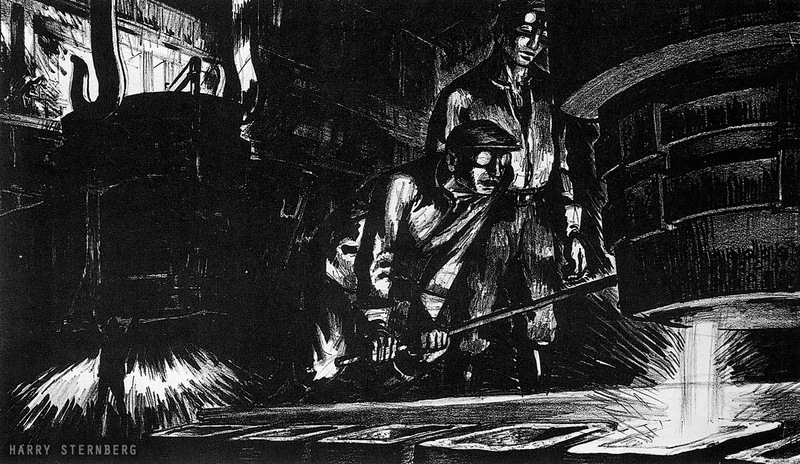 Sternberg's downtrodden workers eventually unionized and gave birth to the American middle class, only to be back on the ropes again in the 21st Century. Protest is again in the air. One thing has certainly changed: for better or worse, the tall, dark forests of spewing smokestacks are vanishing from the American landscape; with them the thousands of skilled and unskilled jobs contained within. 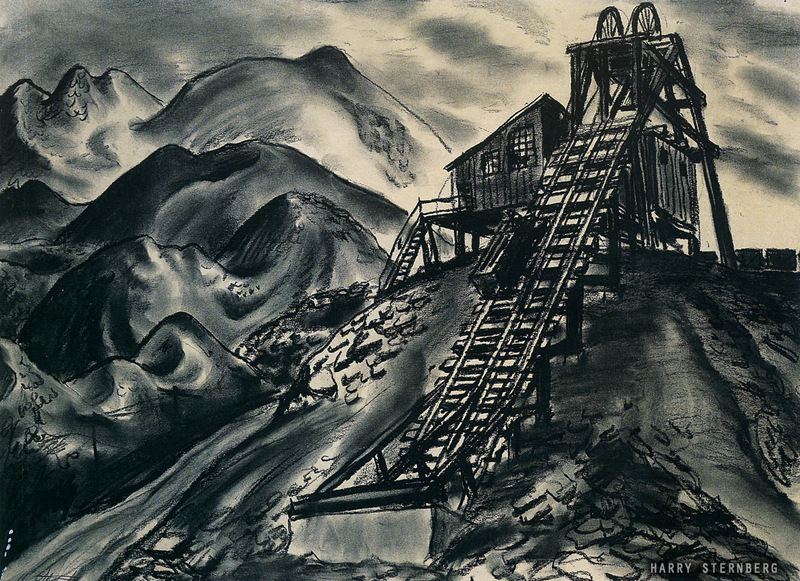 Art like Sternberg's was part of the social reform that came in the mid 20th Century. Decades later it gives us insight to depression-era life and the large problems society faced in those days. Art has always played a role in social reform and will no doubt play a role in the reforms of the 21st Century - as long as artists allow their work to follow their hearts and speak their minds. 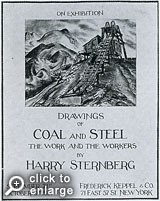 Below is a sampling from Sternberg's Coal and Steel exhibit - Enjoy! Harry Sternberg painted himself, his wife Mary and their infant daughter into this mural he did for the Ambler, PA Post Office. 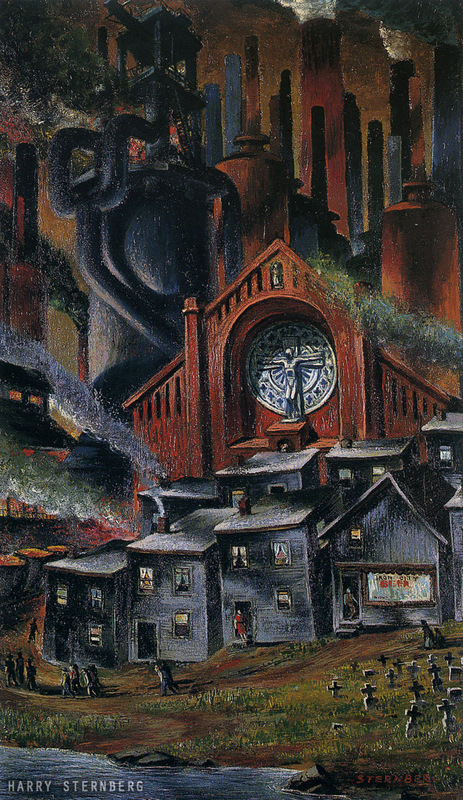 This particular piece was actually not part of his Coal and Steel exhibit, but the influence of his experience in steel country is clear. 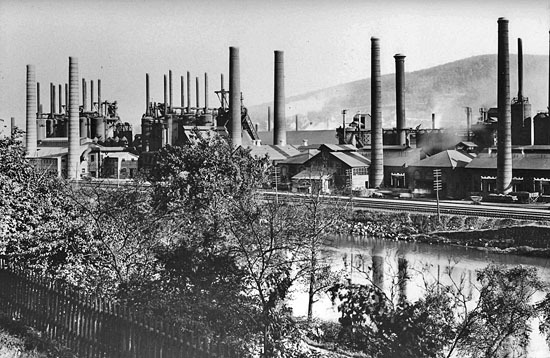 Seventy years after Sternberg marveled at the industrial might of Bethlehem Steel, I was there marveling at its decay. "His home was a company owned shack; the mill in which he worked, the bar in which he found recreation, and looming over this, his church circumscribed his life." 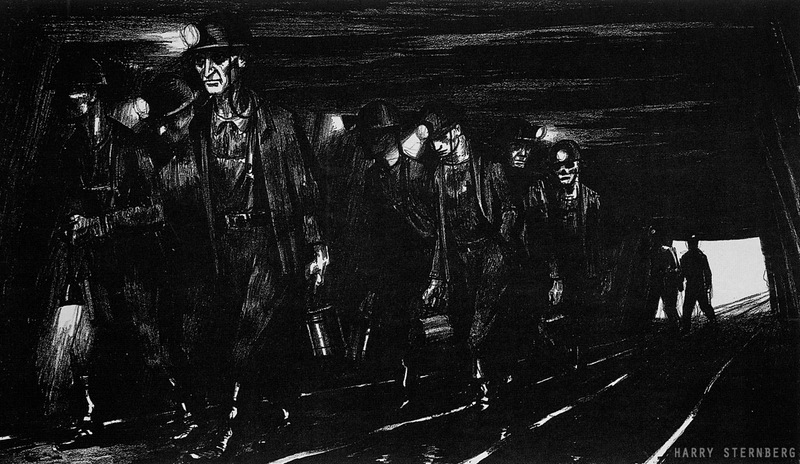 Sternberg was impressed by the soot and blackness in which a coal miner worked. He used a Crayon aquatint to effectively capture that environment. Offset Lithograph. 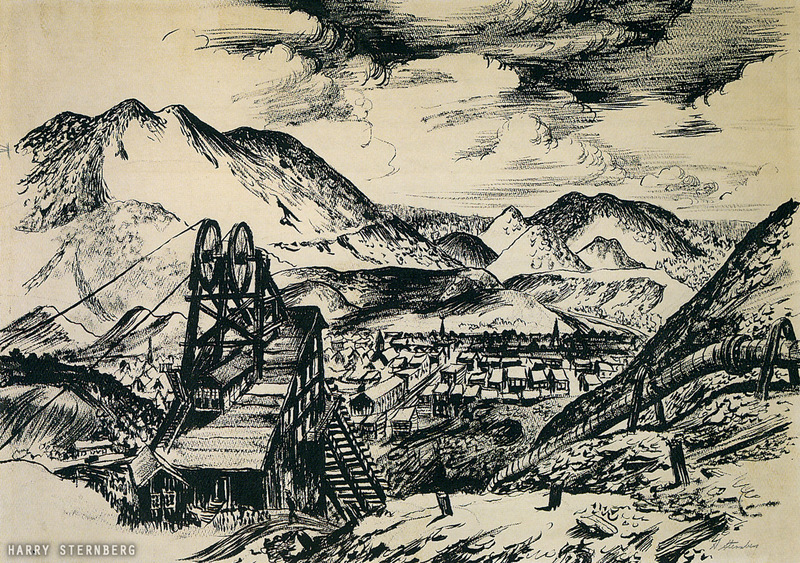 Sternberg's time spent in the mines made him very aware of the dangers involved and the high rate of occupational injury and death. If you closely, you'll see that Sternberg gave one of the miners a skull for a face - no doubt a symbol of the high fatality rate of this occupation.. 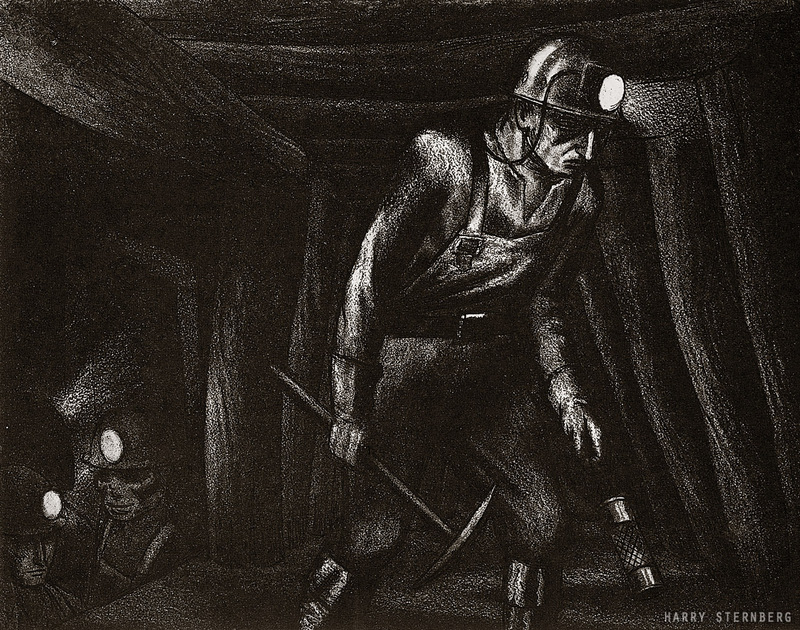 In coal country, Sternberg took note of the worry etched into the faces of the women, and the gauntness of the children. He saw entire towns slipping down into collapsing mines that ran beneath the streets and remarked "It seems profoundly significant that the miners blasting out the supporting coal pillars underground, are often destroying the foundations of their own homes above them." 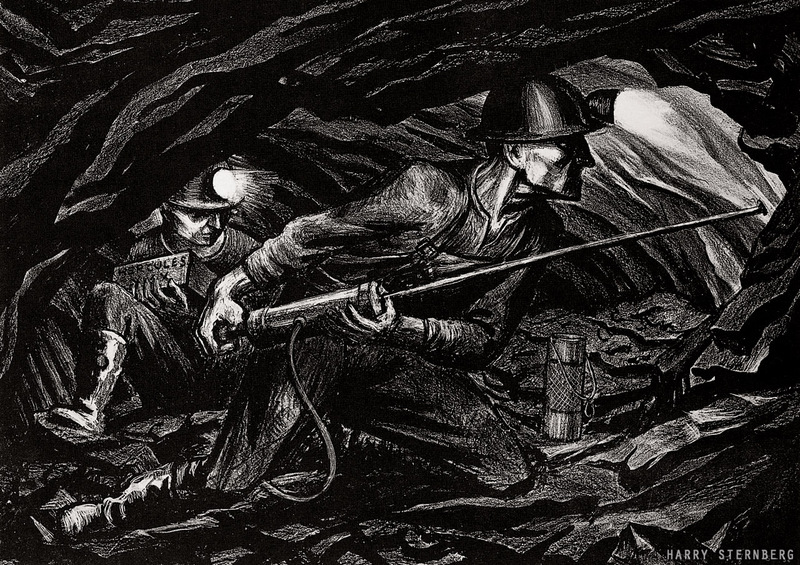 "I watched men working in the breasts, huge domed chambers cut out in the coal veins, digging holes with eight-foot heavy iron hand drills, tamping in the dynamite, setting the time fuses, and shooting the blasts. Everywhere was beauty Rembrandtesque black and white, abstract patterns of tunnel shapes, a thousand cubistic forms in the walls of black blasted coal." "Even the costume of a brave in full-feathered war regalia couldn't beat a miner in his heavy rubber boots, loose baggy overalls, heavy leather belt from which he hangs his safety lamp and electric battery battery for his shining headlamp clipped to the front of his padded helmet, carrying a pick and a box of dynamite"
While doing my own work on PA coal country, I also spent an afternoon in Mahanoy City hunting for coal-industry relics and found an abandoned headframe there - similar to the one pictured here. One of the things that strikes me about Sternberg's work is that we shared many locations. Amazing art, and very important points made. I stumbled on this blog and am very happy I did. Thanks. 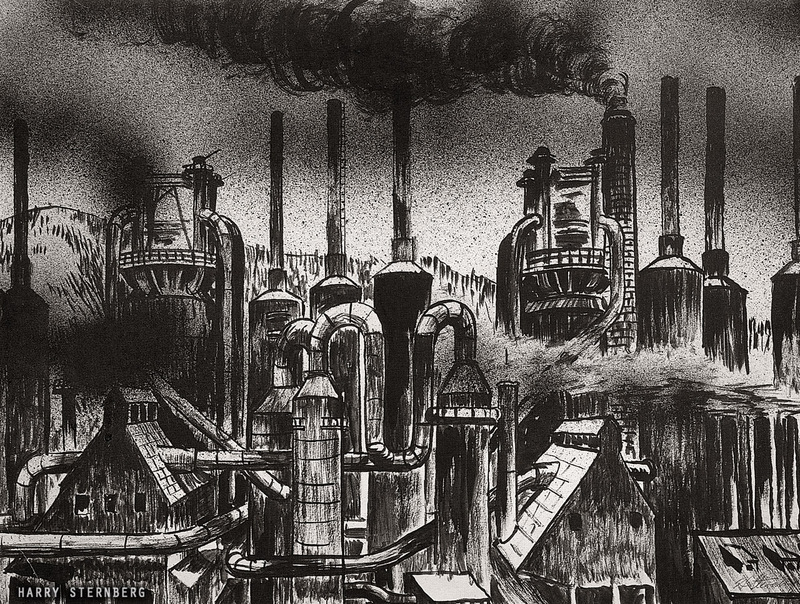 really what qa nice blod you talk about thew history you talk about the depression-era depictions of industry and labor well i really impressed after reading this blog i really like this.